Dolly Parton is having a pretty major week — on Feb. 8, she was honored as the 2019 MusiCares Person of the Year, and during Sunday's Grammy Awards, she returned to the stage to perform for the first time since 2001. She was also honored with a tribute from numerous artists, including Katy Perry, Little Big Town, Miley Cyrus, Kacey Musgraves and Maren Morris, though Parton made sure to take part in the tribute herself. Musgraves and Perry began the tribute with Parton's "Here You Come Again," with the duo sporting teased hair and bright red outfits. Parton then joined the women to finish the song before Cyrus arrived on stage in a glittering yellow suit to to duet with Parton on "Jolene." Next came Maren Morris to sing "After The Gold Rush" with Cyrus and Parton, with the trio showing off their powerful vocals with an acapella section of their performance. 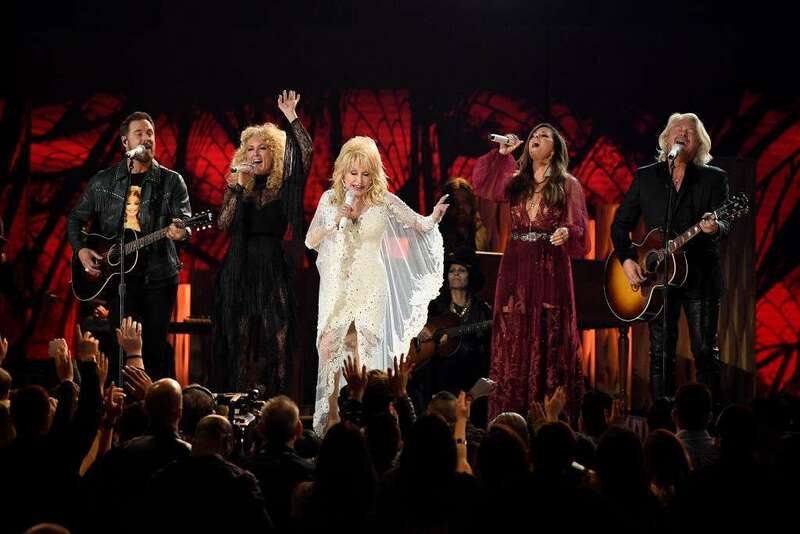 Little Big Town arrived last, with the quartet joining Parton to perform the song "Red Shoes" from the Dumplin' Original Motion Picture Soundtrack, which Parton curated. She and producer Linda Perry wrote a number of new songs for the project, which also included versions of many of Parton's hits. Perry, Musgraves, Cyrus and Morris then returned to the stage, with the group performing an energetic version of Parton's "9 to 5." Cyrus and Parton have a long relationship, as Parton is the "Nothing Breaks Like a Heart" singer's godmother. Parton appeared on Cyrus' Disney Channel show, Hannah Montana, and the two collaborated on a song for the 26-year-old's album Younger Now. They've also performed "Jolene" together on multiple occasions, and Cyrus even performed a version of the track for her backyard sessions in 2012. Also during Grammy week, Parton's exhibit at the Grammy Museum, "Diamond in a Rhinestone World: The Costumes of Dolly Parton," was unveiled, with the star front and center to take a look at the lineup.